Travel - I had to look over photos in order to remind me what has actually happened this year and noticed I've done my fair share of travelling. 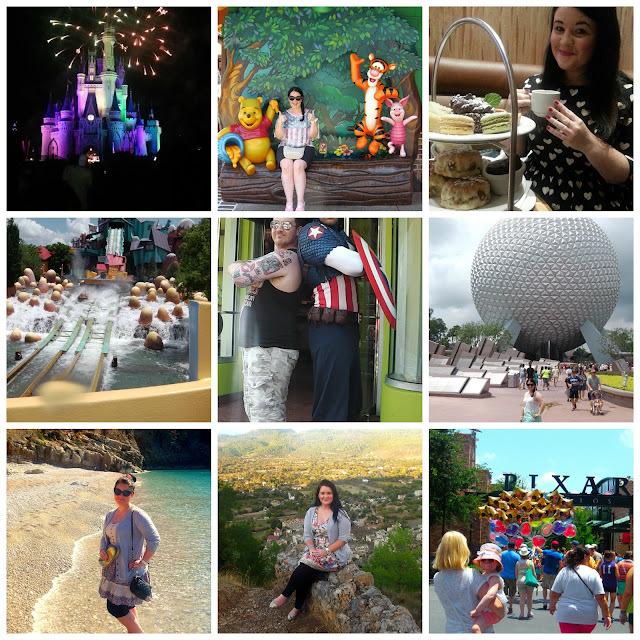 June saw me go on the biggest and most anticipated holiday of them all - Florida, something that I'm actually still halfway through blogging about now. This holiday brought back so many childhood memories which have almost been erased and replaced, which is sad. The holiday also stamp-marked a few issues with my family and made me open my eyes to others personalities; something of which I will not discuss on here but was a turning point for me. A month later both me and my boyfriend spent a few days in Manchester in a gorgeous hotel for his 30th birthday. A month later I was lucky enough to win an all inclusive holiday to Turkey, so we jetted off again to spend a week in the Autumn sunshine. No sooner had we landed on English soil, we were trotting off to London for a few days, mainly so my boyfriend could go to Comic-con (another birthday present). Fast forward 4 weeks and I had won yet another competition to go back to London for an all expense paid trip to Pineapple Studios (which included a dance class, being judged by Arlene Phillips(! ), tea at The Hilton, West End show (Billy Elliot FYI) and a hotel). So all in all, 2013 has been rather kind to me on the travel front! Family/Relationships - Without going into TMI, I have almost learnt to accept an ongoing issue with my boyfriend. It's been hard, and at times I've come close to ending our relationship but I have to remind myself that no-ones relationship is 100% perfect, no matter how flawless it appears on the outside. My mum moved house - a house I'd spent the last 8yrs of my life in before moving into my own home. This is the first home of my mums that I officially have never lived in (or never will). In a strange way, that thought is a little scary. It's a reminder that I'm an adult and will never live with my mum again. I have lived in my own home 2.5yrs and never had a problem with it till my mum actually moved, and the above thought then entered my head. Silly little thought process I have! My niece is growing up way too quick and I only realized it a few days ago after not having seen her for 5 months. I noticed how her speech has developed and she is stringing sentences together a lot more now, and saying things that you wouldn't expect a 3 and half yr old to say! This saddened me a little, even though she isn't my child. She's growing up and slowly losing her baby cuteness. Work Life - I have come to a point at work where I feel I am just plodding, and hitting the 'stop' button one too many times now. Lots of things have changed, and still are changing. It seems new rules are constantly being put in place and management appear a lot more stricter which is making it a more 'nervy' place to work (for reasons I wont go into on here). My actual job role I feel I have lost all love for to the point of almost not caring at all. I remember when I first started my job, hand on heart, I used to love it. Then as a year or 2 passed, this 'love' turned into 'ok', fast forward another 2 years, has now turned into 'dread'. I count the hours down each day which is not how I want to live. Hobbies/Interests - For those that don't know, I'm a comper in my spare time, and this year has been the biggest so far in terms of prizes (which makes sense, considering the time and effort I've put into it!). It's paid off a lot though, and I've won some really good stuff (which I'm contemplating doing a blog post on). It gives me such a buzz and I've become addicted. Unfortunately its a time consuming hobby so I'm trying to make the most of it before I have children! I sometimes even struggle to do it just with a full time job and running a house! My other interests are obviously blogging. The last few months I've become addicted to reading certain bloggers (which can be quite time consuming but so inspirational!). I do try and blog as much as I can but comping takes first priority with me a lot of the times. As of a few days ago (Christmas day, to be exact) I also adopted another hobby, something I've been wanting to get into for a long time, sewing! My boyfriend kindly bought me a sewing machine which I've already spent a fair few hours on. Soon I wont have any spare time left! Its still early days yet but I aim to be making small home accessories by the summer. 2013 was also the year I decided to hang up my camera (and tripod!) and call it a day with filming Youtube videos. It was taking up too much of my time, and although I do miss it at times, I never closed the door completely, and promised to be back with the odd Primark Haul (which I have in fact footage waiting on my camera from a month or so ago, oops!). I do still upload my travel videos there though, when I have the time. All in all, 2013 hasn't been too bad to me! Fortunately for me, the majority of 'negative' things that have/are happening in my life, I am in control of, and I can change, which I am thankful for. It could be much, much worse. What are your highlights of 2013? I'd love to hear them! Oh Kate, you look fab, always have and always will. You are beautiful, and you have no reason to worry about how you look. You will do 'healthy eating' when you are ready to. I also think you have done amazingly to start to come to terms with the issue you had in your relationship - it's a huge deal to feel so rubbish, but you have started to move past it and that's not easy. Happy new year to you, and I will see you soon. This post is honestly inspirational, I really admire you for sharing your honest thoughts and opinions and letting us into your life. This blog is fabulous and a great read, something you should be extremely proud of.